While 2016 will go down in infamy as the year this world lost some of its absolute best from the human race as a whole, the few deaths we have seen at the start of 2017 are providing dangerous rivals to the throne. Yesterday’s passing of the Oscar nominated and Golden Globe winning British legend, Mr. John Hurt, is one such notable loss that the media arts will feel for years to come, but also one that fandom will feel for longer still. Starting from his humble beginnings in the coal mining village of Shirebrook in Derbyshire, England, Hurt was blessed early on with a string of wonderful roles in the first flush of his career, among them being the heroin addict from a Turkish prison in 1978’s Midnight Express, not to mention the gentle and disfigured John Merrick in 1980’s The Elephant Man. While both roles earned him Oscar nominations, in fannish circles Hurt earned his biggest accolades and most memorable cinematic moments as the victim of the chestburster from Alien not only in the original film, but also in the sci fi comedy classic Spaceballs. For the fantasy contingent, Hurt is more recognized and adored as the eccentric Garrick Olivander, well known purveyor of wands for the wizarding community in the world of Harry Potter. He was knighted on July 12, 2015, by Queen Elizabeth III. However, in more recent memory, Hurt, who was fittingly fighting a battle with cancer, became much beloved in the hearts of science fiction fans the world over in the 50th anniversary celebration of Doctor Who, portraying the lost regeneration of everyone’s favorite Time Lord: the world weary, brutal, and otherwise broken War Doctor. A hidden regeneration that occurred between the Paul McGann movie and the Russel T. Davies revival, Hurt beautifully portrayed the toll that the Time War took on the Doctor, breaking open levels of heartbreak and suffering only ever touched on by Eccleston, Tennant, Smith, and even Capaldi as he spurned the creed of The Doctor in order to save the galaxy by sacrificing his own homeworld. 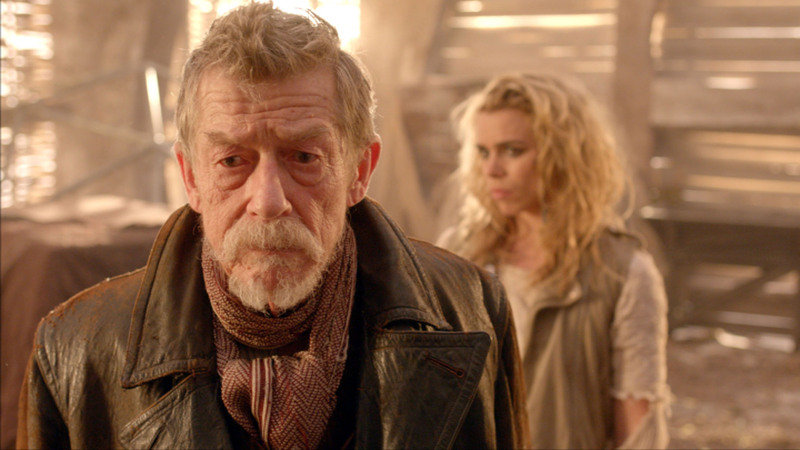 The role, while controversial at its inception, became a favorite for many fans that opened their hearts to “8.5,” as the War Doctor was often affectionately known. Looking well and in seemingly good spirits during his appearance at 2016’s Gallifrey One, a well known Los Angeles based Doctor Who Convention, he remained active and energetic during his relentless fight for survival. In both mainstream and niche media, Hurt is a class act and a rare talent that will be sorely missed, and will never be forgotten. Transparent Aluminum is On Its Way – Thanks, Star Trek! Amongst his earliest and best roles, John Hurt brilliantly shone as Caligula in the BBC’s “I, Claudius”.